Mike and Imogen North warmly welcome you to The Nut Tree Inn. Celebrating 10 years in November 2016 since they opened their dream village pub in Murcott village, Oxfordshire. Mike grew up in the area and he’d always harboured dreams of owning The Nut Tree. In November 2006 he made it a reality when he and his fiancee Imogen bought the pub. The Nut Tree is a traditional village pub which serves great modern British food in the restaurant but is still somewhere you can stop and have a pint or relaxing drink at the end of a hard day’s work. Even our own Nut Tree ales. Within the 15th century thatched building you’ll find a mix of locals and visitors enjoying real ales, fine wines, excellent food and attentive service. 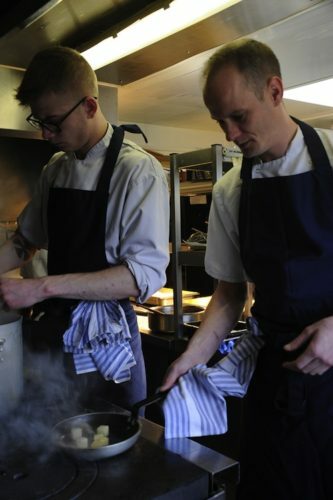 Our bar food also serves our home-made fish and chips. We are delighted to have been awarded a Michelin star for the ninth year running. More accreditations we are so proud of here. We would like to congratulate Head Chef Mary North for getting married earlier this year. Our team were runners up in the Copa Jerez Sherry finals 2016. The eight finalists competed against each other in a live head-to head challenge, in early October, at the Restaurant Show. The esteemed panel of judges voted our team second, only to the Ritz Carlton in London! Well done team. 1984 saw the opening of Le Manoir aux Quat’Saisons, combining breathtaking surroundings with gastronomic excellence. The restaurant swiftly earned 2 Michelin Stars, which it has held for a staggering 29 years. 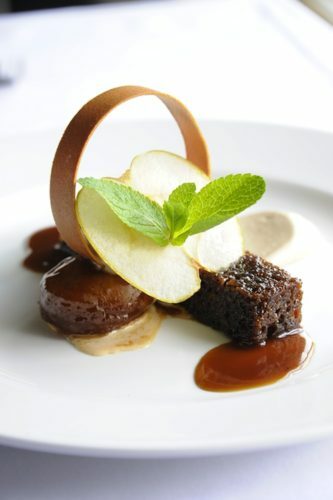 Raymond Blanc and Executive Head Chef, Gary Jones, are passionate about utilising seasonal, organic produce. When sourcing food for the restaurant, they make sure to know everything about its provenance. Rarely can a chef tell you exactly where the milk in your breakfast came from. With dedicated gardeners, Belmond Le Manoir has cultivated herb beds in which 70 traditional and exotic varieties thrive. A 2 acre vegetable garden produces over 90 types of vegetable. A muchroom garden sprouts around 20 edible species, and an orchard brings in beautiful apples, pears and quinces. Raymond Blanc champions an ethical approach to cooking and is devoted to energy efficiency and recycling. Belmond Le Manoir is viewed by many in the hotel and restaurant industry as the model to aspire to.